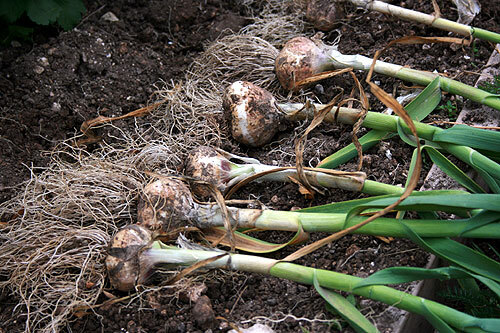 HOW TO GROW GREAT GARLIC – VAMPIRES BEWARE! Earlier in the year I decided to have a go at growing garlic as we’re about 40 miles from the Isle of Wight which is one of the UK’s leading areas for growing garlic. I’ve tried to grow it before using supermarket garlic but without much success, so this year I bought some bulbs from the local garden centre called ‘Lautrec White‘. In mid early April I prepared a small patch in the kitchen garden, first removing the weeds, then digging in a little bone meal as garlic bulbs like to have a well established root system. Then I planted the bulbs about 6″ apart and covered them with some wire netting to stop the birds (and chickens) from scratching them out. Apart from keeping the weeds down and regular watering in the dry weather, that’s about all I did for them. Exactly 12 weeks later I was lifting some lovely garlic bulbs ready for storing. You can tell when they need lifting as the top of the leaves bend over and start to go yellow. I leave them on the surface of the soil for about a week to dry out, then I tie them in a garlic string, and they are stored at the back of the shed where it’s cool . How long did your bulbs last and how did you keep them in the shed? I’m still using them today and they are firm and no sign of any rot. I store them on a wire rack at the back of the shed. The important thing is to try and keep some space between the bulbs until they are nice and dry, then just put them into an old wicker basket, or hang them in strings in the shed until you need them. Have you had problems storing yours? I’ve never actually grown garlic mainly because I was thinking there would be a lot of waste. I use a lot of garlic in my cooking yet the heads I buy always sprout before I get through the head. It was only last month I had someone ask if I had ever grown garlic and told me it was really easy. So…when I saw your post I was intrigued and thought I might give it a try as long as they will keep a long time. Have you ever braided yours? or is that just a romantic notion and more for decor? They are still in the shed and still looking a fresh as the day they were harvested at the end of July, so providing you can dry them well they will keep for a good while. I’ve not tried braided them yet but it’s certainly possible, and they should keep ok providing they are hung in a cool dry place until you need them. One other tip is to make sure you buy garlic bulbs grown for planting rather than planting the bulbs you buy from the supermarket.